How do I select a zero seconds pause duration between audio tracks in Toast 12? The DAO (DIsk at Once) option is selected which is supposed to allow for the adjustment of pause durations between audio tracks. The manual for Toast 12 says to select the audio tracks to pause, click the Pause column, then choose the pause duration. After selecting the tracks to pause I do not see a Pause Column anywhere. There only appears to be two columns above the listing of audio tracks. Namely, the title of the disk to be burned, and next to that, a column titled with the letter S, under which series of numbers appear that are assigned to each track. At first I thought that S stood for seconds, and that the numbers are the number of seconds between tracks, but there doesn't seem to be a way to adjust these numbers. Thanks for any tips on how to select zero seconds between audio tracks in Roxio Toast 12. Are we talking about the same software? Do you not see a column of text that reads “2 sec” to the left of the track names? Or the word “Pause” above it? Clicking there brings up a pop-up menu with other timings, including zero. I'm using the MP3 Disc option because the number of songs I want to burn onto one disc exceeds the 74 minute .wav format available in the Audio CD setting. 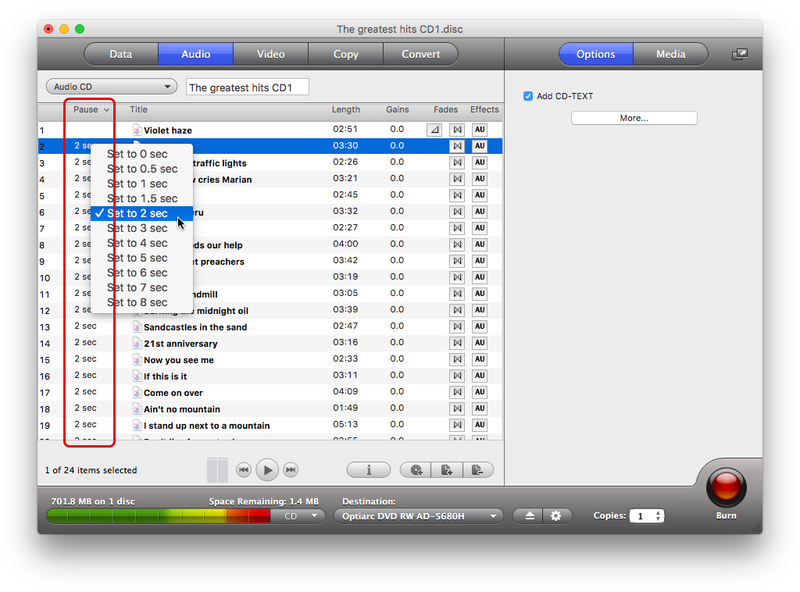 Given that, is there a way to adjust the pause length between songs in the MP3 Disc option? If not, does the Roxio Toast 12 software automatically put a two second pause between audio tracks in the MP3 mode by default? MP3 Discs do not set any kind of pause between songs. Undefined. The playback device may need some time to interpret the files, but that could be anything from 0 to 2 sec. An advanced device could allow a custom pause, even after the disc has been burned. Technically it is just files, not tracks in the same way as an Audio CD.